As a member of the Hobie Fishing Team, it is my responsibility not only to represent the Hobie name in a positive light but also to lead by example. This can take many forms: from teaching folks about the Hobie brand; to showing potential owners how to properly use the Mirage Drive and the rudder system; and even showing new owners how to fish out of a Hobie safely. However, the most important quality of an effective teacher is knowing when it is time to be a student of the game. When it comes to fishing the Chesapeake Bay Bridge Tunnel complex, the most renowned kayak angler in this region and teacher is none other than Kevin Whitley or Kayak Kevin as his many fans and fellow kayak anglers know him. Kevin has spent most of his life on the water in the Chesapeake region, and his knowledge is second to none when it comes to targeting the summer species that inhabit the CBBT brindge complex. On this Tuesday evening, a band of kayak anglers amassed at the Appomattox River Company store in Hampton, VA to hopefully absorb just a smidgen of the vast expertise that resides in that inner space that inhabits the mind of Kayak Kevin. For relative newcomers and somewhat seasoned anglers like myself, fishing the tunnel complexes can be challenging without any prior experience or tutelage on the water from the master himself or others that are proficient in fishing the CBBT like Rob Choi, Lee Williams, and Damien Hall. It is imperative that one take baby steps first before venturing out into the unpredictable waters that roll through this area. 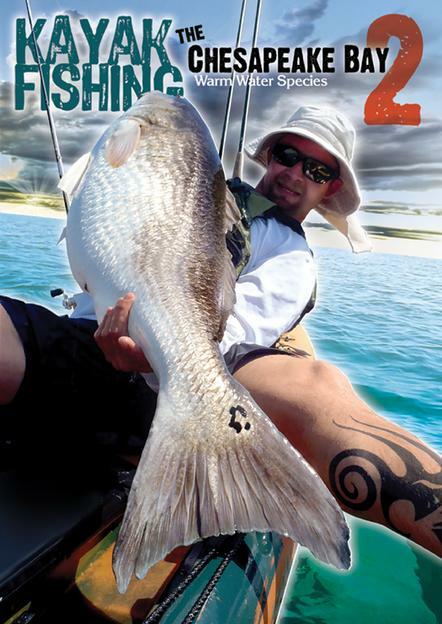 In the two hours that Kevin afforded us this evening, he not only summarized many of the concepts that are presented in digital form on his latest DVD, Kayak Fishing The Chesapeake Bay 2 - The Summer Species. He took his time explaining the nuances of the anchoring in heavy current; the trouble areas/danger zones to avoid; and which currents may be considered too risky to enjoy your time on the water. He even showed us different anchor types and why each type of anchor has its merits in certain situations. As the night progressed, we were granted a special invitation into the fishing mind of Kevin and learned some subtle techniques on how to position the presentation relative to the structure depending upon the species you are targeting. Simple things that the newcomer may miss like I did on my last trip - the leader length on your line for sheepshead is different than the one for tautog or the position of your clam for spadefish relative to the water clarity. Kevin took time to answer a variety of questions relating to: how to read current prediction charts; what wind directions and speeds can affect your decision to head out; what weights should be used in the heavy current flows; proper anchoring techniques differ for the tubes and the areas between the bridges. I admit that I have a pretty good retention factor on things I have heard or seen, but solidifying your understanding of a concept or technique by hearing it straight from the source in person is sometimes all that is needed to hammer that lesson home and ingrain it into your fishing brain. Thanks Vic for opening up these events, and a huge thank you to Kevin for taking time out of his hectic schedule to educate us all. It was and still is greatly appreciated. Ever heard of Smithfield, VA? Here in the state of Virginia, most people have primarily because of Smithfield Hams. Country ham is a staple of life for many folks in this area, including myself. I love country ham for breakfast and order it whenever I can. What I didn't realize was that Smithfield, VA also has some exceptional fishing waters. Recently, I was afforded the opportunity to assist in the scouting of some private property for future Tidewater Heroes On the Water events. The private location was a series of 25 acre ponds separated by access roads and trails completely off the beaten path. The depths of the water ranged from 6" exposed flats to deeper holes that reached up to 15' in some areas. This variation creates exceptional transitions and ambush points for predatory fish. From discussions with the owner, the ponds are stocked with catfish, but also has a thriving bass and bluegill population. After a brief introduction, overview of the rules and where we were permitted to explore, we launched our kayaks and began to assess the location for fishability and opportunities for veterans to catch some fish. As we were preparing to launch, a nice 20" largemouth swam right in front of the main launch........a promising indicator wouldn't you say? The members of TKAA split up to attack both of the main ponds simultaneously - Bill Ragulsky, Mark & Kris Lozier, Wayne Bradby and Lars Antoniszczak attacked the left pond while Chip, his son Drew and myself attacked the righthand pond. Drew launched first and proceeded out to the island in the middle and quickly landed a spunky little 12-14" largemouth. I made my way down the lefthand side and quickly landed one myself just under the 14" mark. I was using my favorite spinning combo for soft plastics, and I had rigged up a 5" finesse worm paired to my favorite soft plastic jig head, the Confidence Baits Draggin' Head. I kept working my way down the bank working every nook and cranny that provided any form of cover. As I made my way back into a cove, I noticed the water was still crystal clear even after a recent storm had hit the area the day before. I typically try and avoid crystal clear water in such confined quaters such as this cove. Stealth and precision are keys to landing fish in areas like this but distance is a key factor to increase your odds of not spooking any fish. Also, the slightest noise or improperly placed cast can spook a fish as well. I was about to bail on this cove and move on when I spotted one of my favorite target areas when hunting for bass. It was a slight change in the bank shoreline creating a deeper "pocket" that was sheltered by an overhanging tree. I made a slingshot cast right against the bank and let it sit for a few seconds. A subtle twitch was greeted immediately by a hungry bass. It zigged and zagged trying to throw the hook, but the Draggin' Head held true......that is until the bass made a very tactical and unexpected move. Just as I was about to lift her into the kayak, she made a 90 degree turn and raced under the kayak creating a sudden leverage advantage and snapped the line before I had a chance to free bail her. She was easily over 17" and was not the ending to the fight I had envisioned. Chalk that one up to poor boat positioning relative to the closeness of the bank in this smallish cove. If I had been just a scant five feet further away, I might have had a chance to react quicker. Not to be dismayed, I tied on a new Draggin' Head and a new finesse worm and hunted for my next target area. As I moved down the bank, the water became real shallow and not "fishy" enough for a good sized bass based upon my past experience. However, I noticed that there were a lot of panfish swimming about, so I tossed out a 1/8oz. black Rooster Tail with the silver blade and quickly had a few hits but no solid takes. A couple minutes later and a spunky little gremlin was added to the mental catch log for the day. It wasn't long before I found another similar spot further down the bank. Sure enough, it held another bass, albeit far from the size of the last one I lost. Nevertheless, a fish is a fish when you are pattern developing on any given day, especially on a new body of water. When I released this one, I was preparing for where my next cast would end up when I noticed a torpedo-like shape out of the corner of my eye. I waited briefly until I noticed the shape move slightly and continues moving slowly along the bank. I slowly opened the bail and made a subtle wrist cast to my left close to the bank about 20' ahead of the fish' current track. My worm made a subtle 'plop', and the shape launched at my tasty offering creating a noticeable wake as it pounced on my lure. At first I didn't think she had it or took any interest in it when she swam away slowly.........until the slack in the line started to move behind her. I quickly set the hook and was greeted immediately by the fury of a perturbed bass. A short fight later, and a chunky 17.5" largemouth made it's way into the kayak. At this point, I had worked almost the entire pond and wanted to make time for the next one. I made my way back over to the launch and dragged my kayak across the path and into the other pond. I worked a treeline that had plenty of shady pockets to target. I worked each little pocket and was pleasantly surprised when a big bluegill decided the finesse worm was the right size. This 10" hit like a bass and fought almost as hard even pulling some drag on my spinning reel at one point. The shaded cover pattern was working good, so I kept looking for more of the same. Unfortunately, the banks on the back half of the second pond did not afford the same structure pattern, but I knew s similar shaded location would be a good target area. I meandered around the back half of this pond and found a shallow flat that was shaded by a large tree. I made a cast across the flat and into a shaded area and was greeted almost immediately with another solid hit. This one measured in at 15" and put up a nice fight. As I released her to go back and get bigger, I noticed several large bluegills patrolling the flat, so I switched over to my ultralight once more and worked the black Rooster Tail across the flat and was promptly greeted by another bluegill - this one measured in at 9.5". A great first outing at this potential new location for our future Tidewater HOW events. We met some amazing like-minded individuals and hopefully can align our schedules in the future to share in this wonderful location and all it has to offer. Tight lines, be safe and take a kid fishing! Recently, I was afforded the opportunity to try a new location with a couple of fellow WKFA bretheren, Darren and Dan. The plan was to launch after sunrise, fish for a few hours and leave before an approaching storm cell caught us off guard. My son had been asking to catch some speckled trout again, so I told him here was his chance. He just didn't realize that joining me would mean getting up at 4am in the morning and leaving amidst some drizzle and rain. We met up with Darren and learned that Dan was already on the water. We made our way to the launch amidst the morning showers and finally arrived to an overcast sky with more rain fast approaching. We unloaded fairly quickly and made our way out to the inlet. The winds were up and blowing out of the NNE at a pretty good clip, so the track out to our primary fishing spot was a little challenging once we made the turn and headed into the teeth of the wind. It was blowing so strong, I had to hold the bow handle on my son's Tarpon 100 in order for him to keep up with Darren and I. We got into position and noticed right away that the birds were dive bombing the surface chasing the finger mullet busting all over the place. Darren quickly setup his anchor and started casting. I positioned our kayaks about 20 yards from shore on the opposite side of Darren on an incoming tide and told my son to make a cast into the breaking surf and work his jig back to him bouncing it up and down. I had pre-tied a basic 1/4oz. round jig head and rigged it with a 4" chartreuse Gulp Mullet. My son was using the spiining combo I had bought him last year - a 6'3" Shimano Crucial Medium Fast spinning rod paired to a Shimano 2500 Sienna spooled with 20lb. Power Pro and a 15lb. P-Line Flouroclear leader. A few short hops and fish on! Nothing of any size, but it was a momentus occasion nevertheless - it was my son's first redfish, albeit a rat red at only 8". It was still cool to finally get him on a new saltwater fish he had never seen before in person. The wind and waves slamming the kayaks broadside was pretty rough there for a bit, when combined with the driving rain we were fishing in, taking photos was a bit sketchy at times. 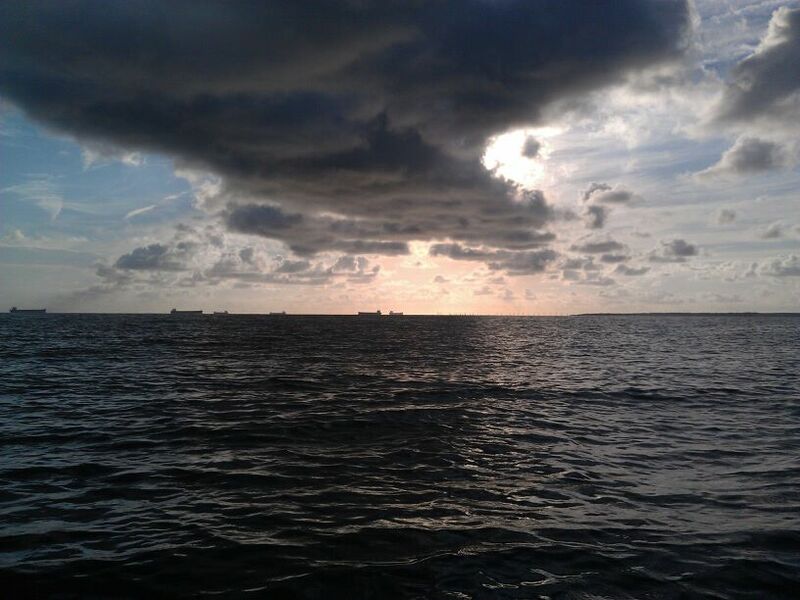 My son quickly became a little frustrated with the rain and feeling of instability being tossed about out there, so after he had landed a few fish - two redfish and a croaker, I manuevered us over to the shore and beached the kayaks and waded the rest of the time we were there. Unfortunately it placed me out of the prime spot for the larger specks, but I was still able to get some action during our short outing. His last redfish slammed his jighead so hard, it almost felt like a larger fish. In actuality, it was another rat red that had deep hooked himself pretty good, but I was able to work the jighead through the last gill plate and cut the barb off with my small bolt cutters. I kept refreshing the fish in the water until I could get everything situated to get him unhooked. The red was released no worse for wear. I had rigged up mine in a similar fashion, except I opted for my preferred casting combo - a 6'8" St. Croix Medium Fast AVID paired to my favorit reel, my Abu Garcia Revo Inshore spooled with 30lb PowerPro and the same P-Line 15lb. Flouroclear leader. I had tied on my favorite Marsh Works Bull Red 1/4oz. jig head and even tried a couple varieties of the Marsh Works Bayou Thumpers, but the chartreuse Gulp ended up being the best lure of the day. I landed my first redfish as well shortly before we beached, so we both had a redfish to our credit for the day. I kept fishing the incoming current while my son played on the beach looking for shells and other signs of life. Shortly after casting, I hooked into my first speckled trout of the day - a nice little 15 1/4" fighter. Followed by another speck, and another and another - all in the 12-14" range. Then I felt a different bite - this one slammed the Marsh Works jig and started stripping drag. When I felt the surge of the rod and the constant dead weight feel, I knew it could be only one thing - a ray. I had hooked this one in the middle of the prime fishing hole and was smack dab in the middle of both Darren and Dan's lines. I steered him clear of their lines, and Dan confirmed my thoughts when he sighted the shape in the water....."Yep, it's a ray and a good one!". I managed to work the him over towards the shore just in time for my son to see him. As if on cue, the ray made an immediate u-turn and surged back to the deep hole and freed himself from the hook. Alas, no photo, but still an awesome fight and even better that my son was there to see it. Oh well, back to the fishing. A few more casts and a different strike was felt this time - a lot lighter but still a quick hard hit. Only a croaker, not photo worthy. He measured a scant 7" and was released to live and fight another day. A couple more casts and another strike only this one didn't fight at all. In fact, it almost felt like I didn't have anything on at all until the retrieve was almost complete - an undersized striper. Wow - five species in under two hours. How cool is that? All from the same spot. I went back to my fishing while my son continued to play in the shallows and hooked into another nice little speck measuring it at a shade over 14". A few more casts and I landed my last fish of the day - another rat red, but this one was a new first for me as well. A red with multiple spots on it's tail. With the storm now clearly visible on the horizon, we decided to head back. I re-launched our kayaks and told my son to just go with the wind and head back. I would be right behind him. The wind had created a little bit of a chill, and my son was getting cold, so he was all too eager to get back to the launch and change into his dry clothes that were most certainly warmer than the ones he was currently wearing. Although it was a short outing due to weather conditions, I believe we made the most of it. We managed to spend time together, did some fishing, and introduced my son to two of my kayak fishing friends. I appreciated Darren helping me launch and recover my son today. It always helps when you have friends like that. I left that location wanting more and knowing that I would soon return for another taste of what it had to offer. Tight lines, be safe and don't mess around with Mother Nature! Friday June 29th was a day I would like to forget, but it was a day of excessive heat, very few fish caught and confirmation of an area that is not as productive as I would have liked it to be during the summer. Although the day was primarily just a leisurely day on the water planned, it turned out to be much different. This outing was slated to take place in Back Creek in the Yorktown area and the Goodwin Islands. I knew the area was shallow from the navigational charts I had reviewed, but the area showed signs of fish activity right after I launched at 7:30am sparking some renewed interest on my part. I launched in the midst of a searing heat spell with temperatures already bordering just shy of 90 degrees and the sun hadn't even begun to approach it's zenith for the day. I proceeded to make my way down the creek on the south western bank and hit every dock piling and pier I could find in hopes of enticing a bite. No love. Lots of bait busting the surface but no bites. I made my way past the commercial fishing docks and worked my way back into some of the finger inlets and creeks. I spotted some small undersized stripers busting some glass minnows back in the shallows, so I made a cast with my Marsh Works jighead paired to a Gulp mullet and quickly started getting several small hits in rapid succession. The tell tale signs of a croaker bite. Not what I was targeting, but they are a blast on light tackle. So, I took a break from my speck hunt and chased some croaker for a bit. I landed several in the 8-10" range and sacrificed several Gulp mullets to the croaker army that was apparently entrenched in this area. I decided to bag the fishing for a bit and do some exploring. I made a slight course adjustment and headed in an easterly direction out towards the southern channel. I patrolled the eel grass beds looking for any signs of feeding fish, but I found nothing of any interest save for a couple rat reds - aka juvenile redfish in the 12" class cruising around. I kept on my easterly track around the southwestern tip of the outermost island and spotted some birds dive bombing this one particular area nonstop. As any fisherman in his right mind would do, I made my way over as fast as I could and was quite surprised at what I found. I had come across a net system where fish were trapped and the local osprey population had homed in on the area and basically had an endless food supply until the local fishermen came and emptied the net. I figured there might be some fish hanging around outside the net as well, so I spent a few minutes trying for anything to no avail. While I was there, I pedaled up to the net and just took a peek in to see what was so interesting to the ospreys aloft in the air. I spotted some sea turtles, puffers, juvenile flounder, skates, cow nosed rays, dogfish, spot and croaker. As I drifted easterly, the fishermen showed up, so I decided to make my way over to the net and watch the harvest. I was amazed at the efficiency at which these guys cleared their net. I drifted up next to them and watched as they tossed back all the undesirable species - apparently, these were croaker and spot fishermen who sold their catch to the local seafood company. I chatted them up a bit and confirmed my earlier observation - this area was loaded with croaker and the occasional spot. They even advised me that a few specks and stripers were around but mostly as the sun goes down. With that tidbit of information, I had to take measure of the day so far and quickly made the command decision to call it a day. The sun was almost at it's zenith for the day, and there was absolutely no wind to be found. I made my way almost 3 miles back to the launch and found myself physically wiped out. While I was loading up all my gear and preparing to leave, I noticed my thermostat was reading 105 degrees!!! Yikes! !I was more than happy to sit in the air conditioned interior while I recovered before heading home. All in all a successful trip, but I wish I had better luck targeting my preferred species for the day. The lesson learned today was more in line with knowing your body's limitations relative to the summer heat. Even though I was worn out from the heat and humidity, I stayed hydrated throughout the day having brought 4 different bottles of water. All too often, we can become soe focused on our fishing efforts, that we ignore our basic human biology needs of staying hydrated on a hot searing summer day like I experienced. I'll do some more speck hunting as the summer progresses, so keep your eyes peeled for a future report of my next speck hunt. Until then - tight lines, be safe and always bring more water than you think you will need!! You never know when your fishing buddy or another person on the water may need it!! Mother Nature can be cruel at times when kayak anglers are in the midst of planning an outing, and even worse, while you are out on the water. But every once it awhile, she can be a kind and generous soul. 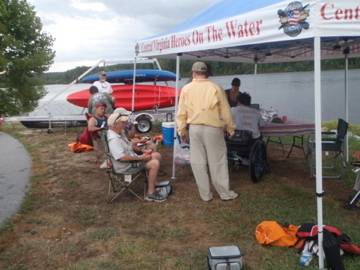 Such was the case at the monthly Central VA Heroes On the Water event at Sandy River Reservoir yesterday here in Virginia. The forecast called for periods of rain with a chance for a strong thunderstorm, but the members of the leadership team mustered the troops and we headed to the site not wanting to risk the chance of denying our heroes one of the few chances they have to enjoy time away on the water. When we arrived, the sky looked ominous, but the approaching storm decided to take a different track for the next few hours and graciously passed to the south. Once the heroes arrived, we spent the first few minutes catching up on any events that may have happened in the past month the heroes might enjoy. Stories echoed through the air of family outings, new tackle and equipment, fish that had been caught, or any number of topics while preparing to launch. Ultimately, the chatter dissipated as the focus of the day took hold and the heroes launched to make their way to their preferred spots for the day. Some of the heroes that participate in our events require additional stability. For those heroes, we install flotation devices known as stabilizers or AMAs. 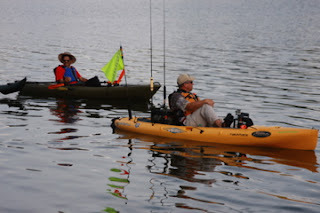 The AMAs provide additional flotation support via small inflatable pontoons and create a larger footprint on the water and increase the overall stability of the fishing kayak used. After loading up their gear, we helped them into their respective kayaks and off they went. While the day was a success with respect to spending time on the water with some of our heroes, the fish action was scarce to say the least. There were a handful of bluegills caught and a couple small bass, but no real fish stories of note. The time on the water I think is all the action most of our heroes really want and desire. The fish are just an added bonus. As we started to make our way back towards the launch, we could hear the distant sounds of a storm brewing as Mother Nature warned us it was time to get off the water. So we all started to head back in for our evening meal knowing that it signified the end of the day. The evening meal was graciously provided by Charley's Waterfront Cafe and consisted of some delicious fried chicken and homemade cole slaw. With everyone safely out of the water, we all sat down and eagerly enjoyed the wonderful food set before us. Even though the time on the water was cut short by the approaching storm, it was still a successful event. The winds began to increase in strength, and we all knew that the event would have to end sooner than we wanted. A quick gust of wind sent the contents on the table onto the ground and re-affirmed what we all begrudgingly had to accept.......it was time to pack and leave. We loaded the kayaks onto the trailer and packed up all the PFDs, paddles and associated gear into the truck. We said our goodbyes knowing that it was only for a couple weeks when we would see each other again. Until next time, tight lines and be safe. Friday the 13th, a day that many hold their own superstitions or personal preferences on how to handle their day. For some, it is a day of dread and fear of something happening, while others simply go about their daily lives without any changes or hang ups on a silly date affecting their lifestyle choices. If I had known then what I know now, the former would have been the modus operandi for me today. The day started off at 4am to the sound of my alarm chiming as I rose from my all too short slumber of 4 hours. The night before, I had pre-rigged two rods (one heavy, one medium heavy) for live bait presentations, a third with a small profile jig and a fourth with a 10" soft plastic in the event any larger predators made their way into my view. By 4:35am, I was out the door and on my way to Oceans East 2 to get some clams and fiddler crabs for the day's target species....spadefish and sheepshead. The 4 mile traffic delay at the Hampton Roads Bridge Tunnel should have been the warning I needed to avoid the Chesapeake Bay Bridge Tunnel, but me being the stubborn person that I am plodded along through the delay and arrived at OE2 a few minutes after 6am. Behind the counter, a friendly face helped me in my decision on how much bait to purchase - a dozen clams and two dozen fiddlers should do the trick. While I was there, I couldn't help myself when I passed the Marsh Works display. I snagged three packs of the 3" Bayou Thumpers in colors I was running low on and added them to the total purchase. I made my way over to the beach and was fortunate enough to find a spot right next to the launch. I took my time and loaded up the gear I would be taking, stowed the live bait and shoved off. The surf launch was calm, and I quickly made my way to the bridge pilings to start my quest. As I pedaled away from shore, I took time to look over my shoulder to see the sunrise on the horizon. I had missed the first hint of sunrise by only 20 minutes or so due to the traffic delay, but the sunrise was still a beautiful sight to see. By the time I got on the water, high tide had long since been reached, the slack tide was ending and the start of the outgoing tide had begun. A little voice inside my head tried to warn me and inform me that the day was going to be a struggle. The predicted current flow from NOAA was -.7, but I had been at the CBBT previously when the same predictions were in the same range and they ended up being greater. Before the current started to ebb at maximum flow, I was able to manage 5 croaker, albeit the last one by pure accident. I'll explain a little later. Remember, I said today was a day of firsts. It was the first time I had used clams and fiddlers as bait; the first time I was targeting spadefish; the first time I was targeting sheepshead; the first time I would be able to look at the CBBT structure using my Elite 5 DSI; and the first time I was on the lookout for "Mr. Brown", otherwise known as a cobia. All of these seem like worthy reasons to spend the morning on the water right? Along with the photos above of the bridge complex, I also captured this one showing the effects of the ebb current and how rough it was.....notice the angled photo? The kayak was tossed around pretty good today, albeit no white caps but it was ripping much greater than the -.7 predicted in my opinion. I stopped and chatted with various boaters all along the complex. It seems we all were having a tough go of it today. The boaters were using gudgeons for the most part and not having much luck. And even managed to capture a few images of the Elite 5 DSI in action, with this one being the best showing a huge bait ball and some structure on the bottom. About midway through the morning, shortly after the 4th croaker, I had made my way from piling to piling in search of the spades and had made the decision to stop chasing spades and focus on sheepshead for a bit. So, I reeled in the clam bait and was ready to secure it. While sitting in a balanced position, I was looking downward at the live bait rig I had just retrieved, when I got an uneasy feeling suddenly. You know that feeling that someone is watching you or that something just doesn't feel right? At that precise moment, I heard a wave crest and looked up in time to feel the entire kayak surge upward and roll left lifting me literally out of the seat and over I went into the 81 degree water. I managed to slow my fall and basically slipped over the side somehow while maintaining a hold on the kayak. My life surged before me in slow motion as I felt the water rush into my clothes and into my eyes and ears. Some of my recently purchased items were still present and functioned according to plan and design. My newly purchased Olympus Tough TG-320 was now swimming amongst the fishes, but it was saved by the camera float wrist strap I received this past Christmas. My newly purchased Standard Horizon HX-751S Floating VHF Marine Radio was getting a nice bath as it it bobbed along the surface awaiting rescue. The other saving grace was a product I had purchased after I had lost a rather costly combo at the HRBT this past November to a rogue wave. That product I purchased was the 3 pack of Blakemore Rod Savers. 3. A small package of jig heads specifically for spadefish - not much value but the only ones I had today. I basically was crushed at this point - I had two dozen fiddlers with no means of hooking them, weighting them down or dropping them into the water. So, the plan of targeting sheepshead was over before it even began. The spades were nary to be found, and the only fish caught on the day were runt croakers. To add insult to injury so to speak, when I finally located the Calcutta drifting along, I reeled in the line that had been pulled out from the loosened drag I had set and discovered the fifth and final fish of the day - a 6" rat croaker. 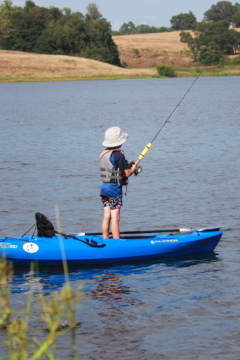 I didn't give up - I kept fishing each piling diligently like Kayak Kevin and Rob Choi taught me. I started high in the water column and worked my way down a foot or so at a time to no avail. By the time I had made it out to the first island, I was needless to say a little demotivated at this point. I ran into Rob Lee while I was out there, and he reported that he had been catching nothing of any size either - he had landed some croaker, an oyster toad and a couple baby rock bass. By this time, my stomach started talking to me, and I knew my day was close to an end. I knew that if I had not located the spades by late morning that my day would be pretty much over. So, I slowly made my way back to shore fishing more of the pilings until I had reached the small boat channel. I decided that I had worn out my welcome for the day and made my way back. I recovered at the beach successfully without any incident in the gently crashing surf zone and packed my gear and left. A day that started with so much promise ended with utter frustration and disappointment. Some would say that any fish is better than no fish, in fact I utter that statement many times over to myself. But when you have a plan and it goes completely south beyond your control, you can see how one could be a little frustrated. This marks the third time I have been to the CBBT and not landed my target species. While the day ended in frustration, I know I'm still stubborn enough to go and do it again!! #1 - don't take anything on the water that you are not willing to lose and have to replace. It's a cruel fact about fishing out of a kayak, especially in heavy current. #2 - what you do take, make sure you have some form of leash or flotation aid capability in place. Anything that is not leashed or has flotation will drop like a rock and be lost most likely forever. #3 - self awareness and kayak positioning are critical to handling sudden changes in wave direction or wakes that may arise. If I had positioned myself to face the incoming waves a little better, I might not have been surprised and tossed like a rag doll. I also would most likely still have all my gear. #4 - possibly the best lesson of all. Do not head out into heavy current without the ability to re-enter your kayak with the gear and rigging you will use on a given day. Self-recovery in moving water on an basic kayak is relatively simple compared to righting one that is loaded with rods, tackle organizers, safety flags, etc. that create significant resistance. 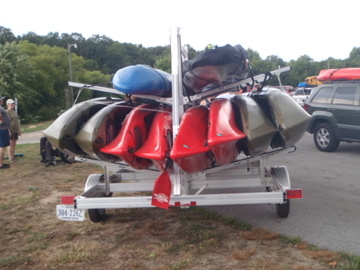 These items also potentially limit how you can re-enter the kayak once it is righted. I hope others can find some takeaways or lessons learned in my mistakes and avoid a similar situation in the future.